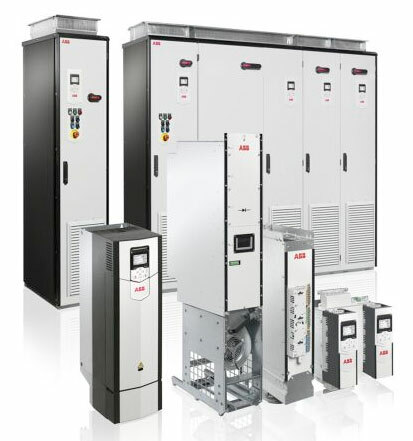 ACS880 Industrial Drives are designed on ABB’s common drives architecture. They are customized to the precise needs of industries such as oil and gas, mining, metals, chemicals, cement, power plants, material handling, pulp and paper, sawmills and marine. They are designed to control a wide range of applications including cranes, extruders, winches, winders, conveyors, mixers, compressors, pumps and fans. The drive comes in nine different frame sizes (R1 to R9) for easy installation and commissioning. At the heart of the drive is direct torque control (DTC), ABB’s premier motor control technology. The extensive range of options include EMC filters, encoder and resolver interfaces, du/dt filters, sine filters, chokes and brake resistors, as well as application specific software. Built-in safety features reduce the need for external safety components. Multiple drives can be daisy-chained for synchronized drive-to-drive communication. The drives offering includes enclosure classes IP20, IP21 and IP55 for dusty and wet environments. Our offering also covers an option for flange mounting with IP55 back side protection. In flange mounting the control electronics are separated from the cooling airflow for better thermal management.